Group Sales Coordinator provides administrative assistance to the sales team and also supports them in various job tasks. Even though they don’t sell products or services directly, they coordinate with the sales team and help in-house sales force by scheduling appointments, ensuring that the sales personnel are equipped with samples, brochures, and sales materials. They also collaborate with the sales department and various other departments like marketing and adverting to promote the product. The Other job tasks listed for these coordinators include responding to customers complaints, giving after-sales support, storing and sorting financial and non-financial data, handling process orders and monitoring team progresses. 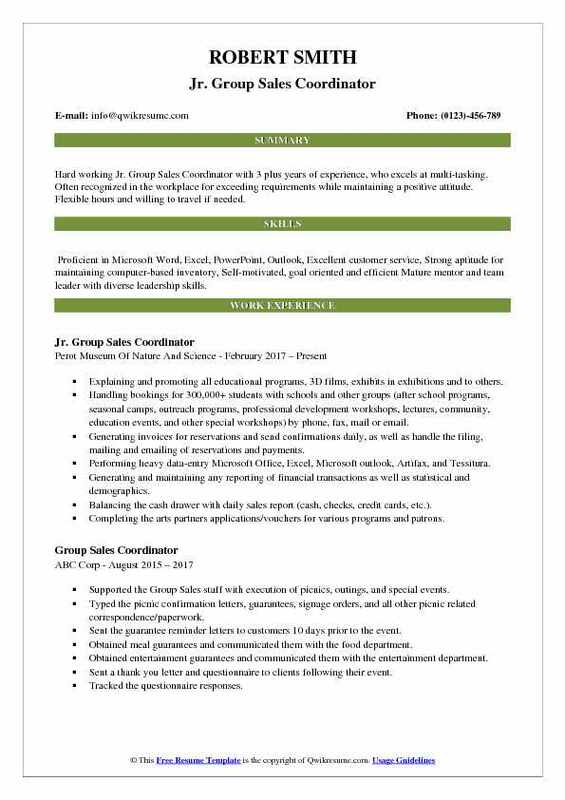 Hiring employers prefer Group Sales Coordinator Resume that depicts proven sales experience, good computing skills, aptitude in problem-solving with proficiency in MS Office. A degree in Business administration or related field is the minimum qualification for this job post, though employers choose those resume that contains additionally a certification in marketing or sales. 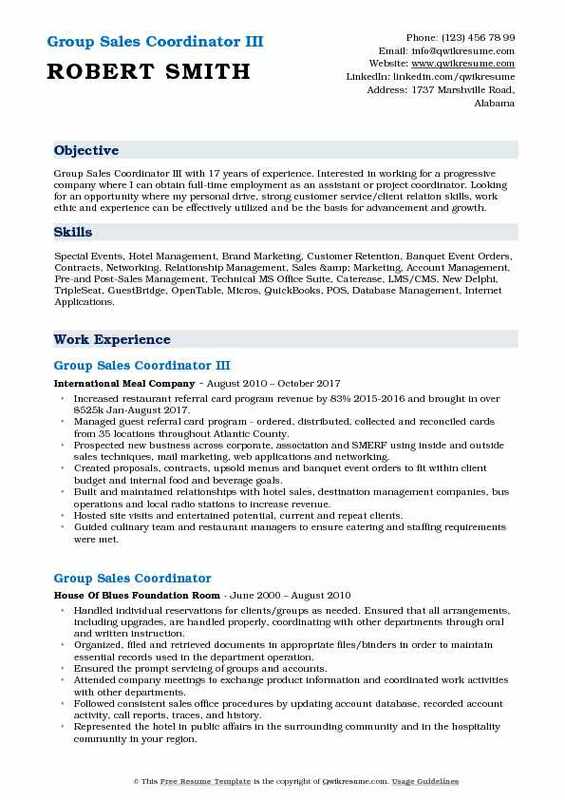 Summary : Group Sales Coordinator with experience in the Food Management domain is looking for a position with a company where I will be able to maximize my 14 years experience in customer-service along with my data-entry abilities and computer proficiency. Soliciting new and existing accounts to meet and exceed revenue goals through telephone prospecting and written communication. Assisting all 328 restaurants to help build sales at a local level and provided additional support when needed. Driving business through outbound follow-up calls and lapsed customer calls. Answering and responding to phone and website prospects from tour companies and other travel groups, providing information about the benefits of our buffet restaurants and securing potential business. Retaining the existing accounts by researching and resolving any customer problems and conducting follow-up calls to identify future business needs. Following-up with lapsed users and resolved any issues that may have occurred with the goal of winning back future business documenting contact in clarity soft. Creating the daily and weekly reports for group sales through excel spreadsheets. Creating group reservations, ensuring that meals were scheduled in the appropriate restaurant location and confirmation details were communicated to both customer and restaurants. Helping the customers' plan trips and find locations that would work best for their groups providing great customer service. Objective : Junior Group Sales Coordinator with 4 plus years of experience in the Hospitality domain. Hold a high passion for my commitments and am a strong team contributor. Remain calm and collected in high stress situations while maintaining a positive attitude. Driven sales professional excited for the next step in my career. 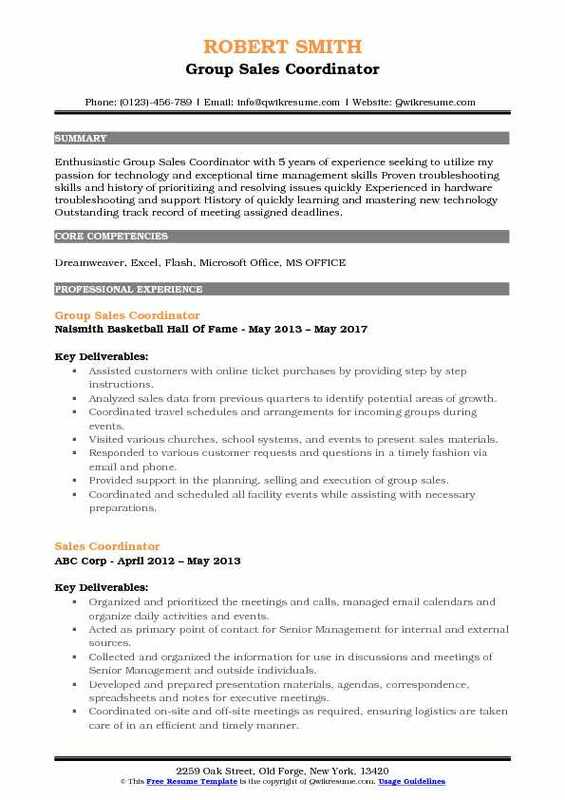 Skills : Appointment Setting, Large Volume Out-bound Calls, Customer Retention Computer Include Microsoft Word, Microsoft Outlook, Publisher, Microsoft Excel, ACT, Internet Research, Data Entry Excellent Problem Solving, and Communication. Presenting contracts to potential group blocks for weddings, sports, and businesses. Intake of sales inquiries for events and group reservations. Processing deposits. Coordinating flow of production between all hotel functions such as housekeeping, front desk agents, and management. Assisting staff duties included executing company policies, procedures, and programs. Timing and tailoring service style critical to successfully providing guest with optimal service. Provide the type of unique and genuine care that guest will be satisfied. The knowledge and skill set to make an effective team player and providing guest with the highest level of quality service. Gathering materials and assembling the information packages using sales techniques that maximize revenue while maintaining existing guest loyalty to the brand. Providing answers to clients about the properties facilities and services, while serving as a point of contact to communicate with them by phone or email to respond to their requests. Objective : Hard working Jr. Group Sales Coordinator with 3 plus years of experience, who excels at multi-tasking. Often recognized in the workplace for exceeding requirements while maintaining a positive attitude. Flexible hours and willing to travel if needed. 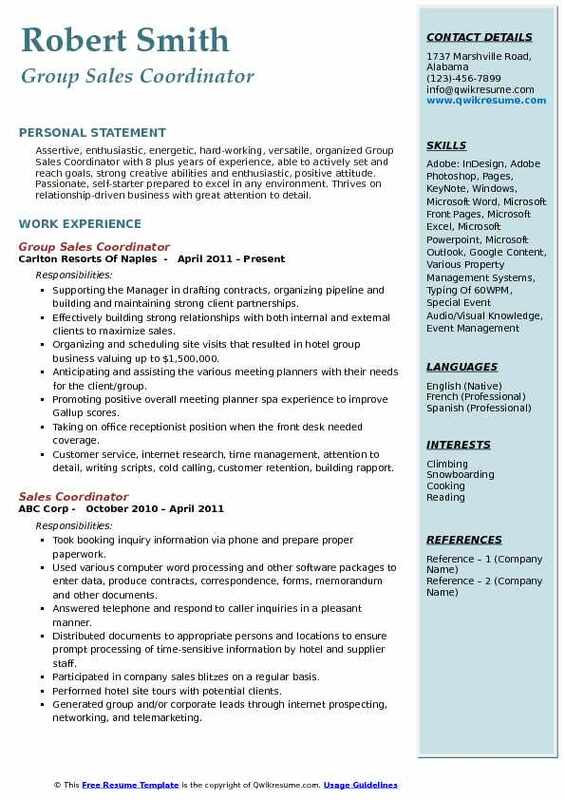 Skills : Proficient in Microsoft Word, Excel, PowerPoint, Outlook, Excellent customer service, Strong aptitude for maintaining computer-based inventory, Self-motivated, goal oriented and efficient Mature mentor and team leader with diverse leadership skills. Explaining and promoting all educational programs, 3D films, exhibits in exhibitions and to others. Handling bookings for 300,000+ students with schools and other groups (after school programs, seasonal camps, outreach programs, professional development workshops, lectures, community, education events, and other special workshops) by phone, fax, mail or email. Generating invoices for reservations and send confirmations daily, as well as handle the filing, mailing and emailing of reservations and payments. Performing heavy data-entry Microsoft Office, Excel, Microsoft outlook, Artifax, and Tessitura. Generating and maintaining any reporting of financial transactions as well as statistical and demographics. Balancing the cash drawer with daily sales report (cash, checks, credit cards, etc.). Completing the arts partners applications/vouchers for various programs and patrons. Coordinating with all areas of the property for incoming group’s needs. Objective : Accomplished Group Sales Coordinator with expertise in leadership, event management, sales, and marketing, with a demonstrated history of success in customer satisfaction, conflict resolution, building partnerships, and networking. Detail oriented self-starter and quick learner with strong communication skills; well-versed in leading staff, training, and mentoring; excellent interpersonal, team, and time management skills. Developing, managing, and executing the department budget and marketing strategies, which drove increased group sales, touring, and adult engagement, resulting in 40% increased revenue from the previous fiscal year. Creating and maintaining the contracts, packages, promotional offers, and marketing collateral for groups and events department. Building and managing, and delivering the content for online group sales webpage. 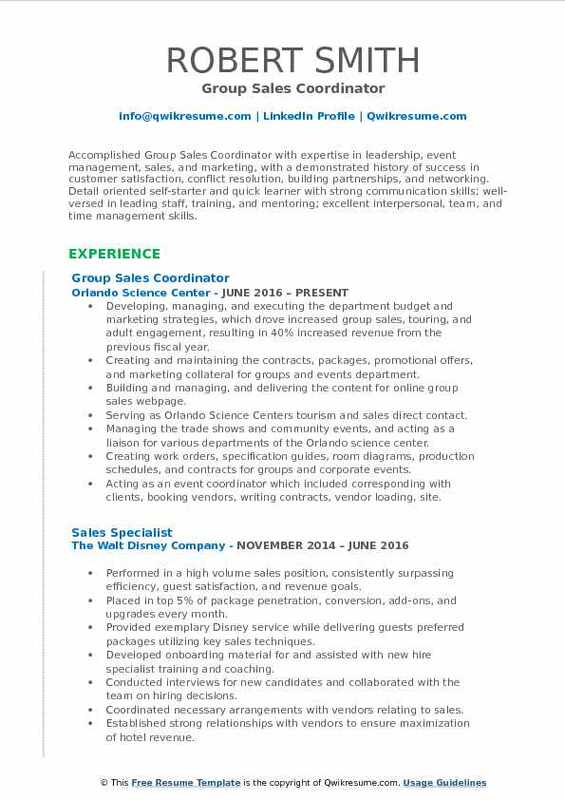 Serving as Orlando Science Center's tourism and sales direct contact. Managing the trade shows and community events, and acting as a liaison for various departments of the Orlando science center. Creating work orders, specification guides, room diagrams, production schedules, and contracts for groups and corporate events. Acting as an event coordinator which included corresponding with clients, booking vendors, writing contracts, vendor loading, site. Visiting, managing the setup and break down crews, and other various responsibilities. Summary : Assertive, enthusiastic, energetic, hard-working, versatile, organized Group Sales Coordinator with 8 plus years of experience, able to actively set and reach goals, strong creative abilities and enthusiastic, positive attitude. Passionate, self-starter prepared to excel in any environment. Thrives on relationship-driven business with great attention to detail. Supporting the Manager in drafting contracts, organizing pipeline and building and maintaining strong client partnerships. Effectively building strong relationships with both internal and external clients to maximize sales. Organizing and scheduling site visits that resulted in hotel group business valuing up to $1,500,000. Anticipating and assisting the various meeting planners with their needs for the client/group. Promoting positive overall meeting planner spa experience to improve Gallup scores. Taking on office receptionist position when the front desk needed coverage. Customer service, internet research, time management, attention to detail, writing scripts, cold calling, customer retention, building rapport. Following up with the past client events by sending out surveys. Compiling Guest Surveys and distributes them to Department Heads. 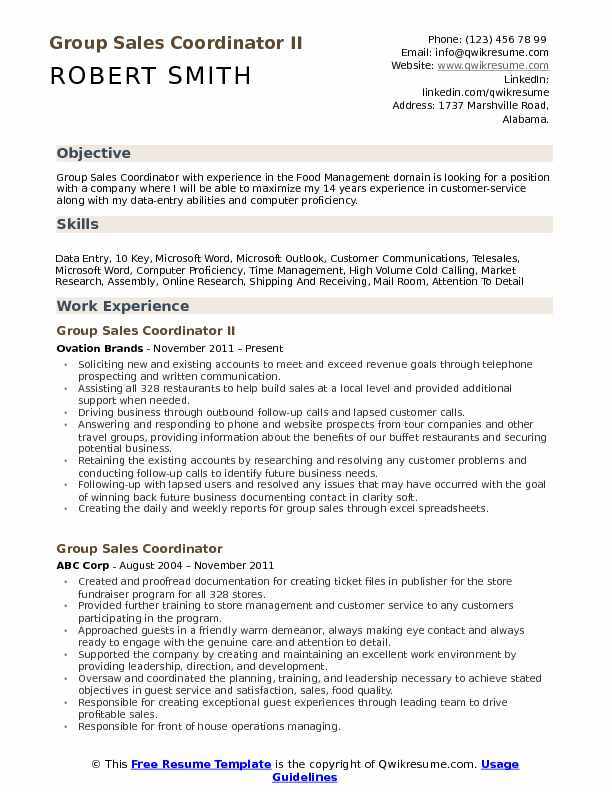 Summary : Group Sales Coordinator III with 17 years of experience. Interested in working for a progressive company where I can obtain full-time employment as an assistant or project coordinator. Looking for an opportunity where my personal drive, strong customer service/client relation skills, work ethic and experience can be effectively utilized and be the basis for advancement and growth. Skills : Special Events, Hotel Management, Brand Marketing, Customer Retention, Banquet Event Orders, Contracts, Networking, Relationship Management, Sales & Marketing, Account Management, Pre-and Post-Sales Management, Technical MS Office Suite, Caterease, LMS/CMS, New Delphi, TripleSeat, GuestBridge, OpenTable, Micros, QuickBooks, POS, Database Management, Internet Applications. Increased restaurant referral card program revenue by 83% 2015-2016 and brought in over $525k Jan-August 2017. Managed guest referral card program - ordered, distributed, collected and reconciled cards from 35 locations throughout Atlantic County. Prospected new business across corporate, association and SMERF using inside and outside sales techniques, mail marketing, web applications and networking. Created proposals, contracts, upsold menus and banquet event orders to fit within client budget and internal food and beverage goals. Built and maintained relationships with hotel sales, destination management companies, bus operations and local radio stations to increase revenue. Hosted site visits and entertained potential, current and repeat clients. Guided culinary team and restaurant managers to ensure catering and staffing requirements were met. Worked with resorts casino hotel departments, hotel sales, audiovisual, security, marketing and catering to client special requests, as needed. Attended trade shows, bridal expos, and created marketing collateral for distribution. 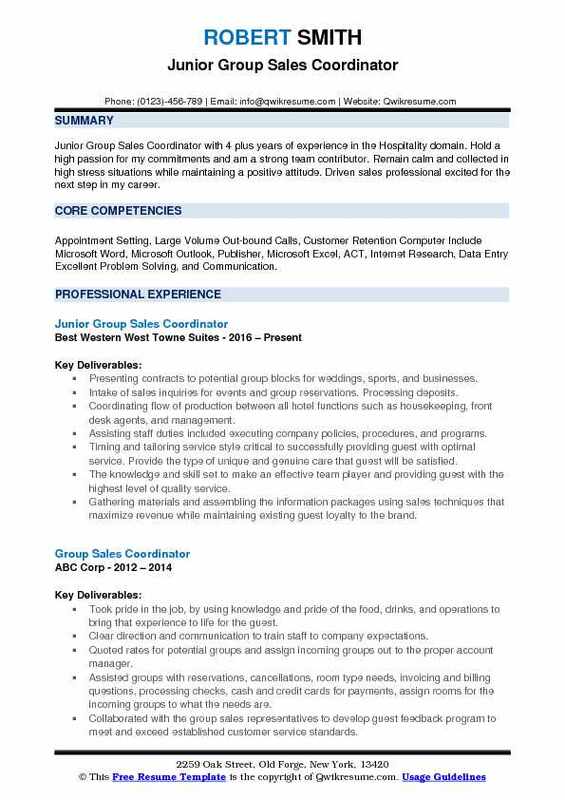 Objective : Group Sales Coordinator with 2 plus years of experience in the Hospitality domain is seeking to obtain a position that expands my knowledge in the customer service industry. With my highest level of loyalty, be able to provide outstanding communication and guest services, exceed day-to-day functions, standards and goals. In addition, a position that will challenge my professional development. As coordinator responsibilities include, but not limited to; assist guests with interest in booking events at our location or catering off-site. Provided sales and package information to guarantee complete satisfaction for every guest/host of each event. Coordinated events ensuring proper communication with management, culinary and group sales staff for organized and accurate preparation for each event. 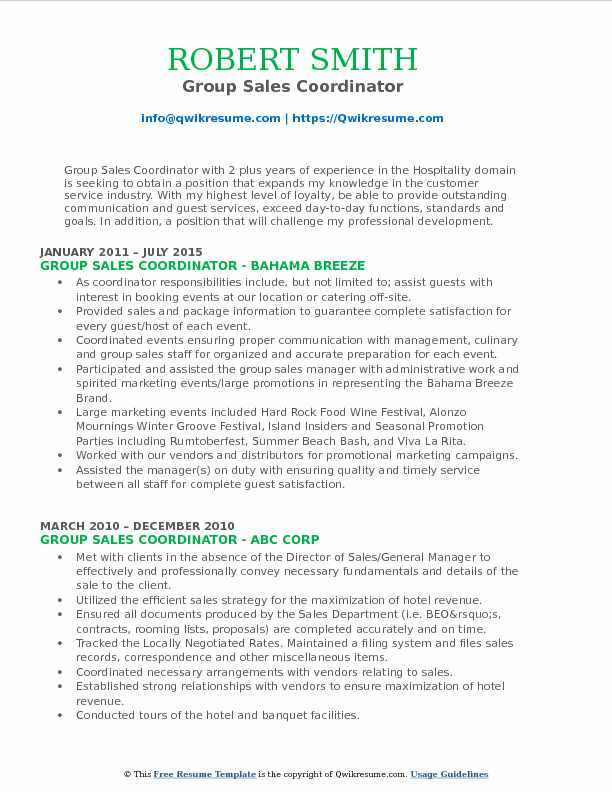 Participated and assisted the group sales manager with administrative work and spirited marketing events/large promotions in representing the Bahama Breeze Brand. Large marketing events included: Hard Rock Food Wine Festival, Alonzo Mournings Winter Groove Festival, Island Insiders and Seasonal Promotion Parties including Rumtoberfest, Summer Beach Bash, and Viva La Rita. Worked with our vendors and distributors for promotional marketing campaigns. Assisted the manager(s) on duty with ensuring quality and timely service between all staff for complete guest satisfaction. Lead all greeters and engage with visiting guests, entering, during their visit and as they exit, making sure each guest feels welcomed and their experience is memorable to ensure their return. Cash handling, executing guest or team member issues by proper procedure, assist in any area of the restaurant where needed. 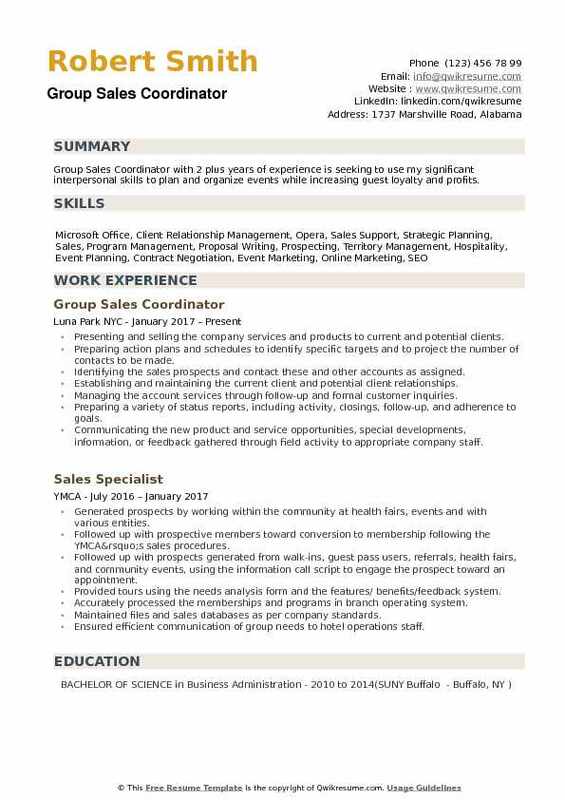 Headline : Enthusiastic Group Sales Coordinator with 5 years of experience seeking to utilize my passion for technology and exceptional time management skills Proven troubleshooting skills and history of prioritizing and resolving issues quickly Experienced in hardware troubleshooting and support History of quickly learning and mastering new technology Outstanding track record of meeting assigned deadlines. Assisted customers with online ticket purchases by providing step by step instructions. Analyzed sales data from previous quarters to identify potential areas of growth. Coordinated travel schedules and arrangements for incoming groups during events. Visited various churches, school systems, and events to present sales materials. Responded to various customer requests and questions in a timely fashion via email and phone. Provided support in the planning, selling and execution of group sales. Coordinated and scheduled all facility events while assisting with necessary preparations. Used Microsoft Office products to ensure event planning is accurate and organized. Assisted the groups with reservations, cancellations, room type needs, invoicing and billing questions, processing checks, and credit cards for payments. Assigned the rooms for the incoming groups to what the needs are. Summary : Motivated Group Sales Coordinator with eight years of multi-faceted experience in fast-paced, team-based environments requiring adaptability, interpersonal and conflict resolution skills, and excellent verbal and writing abilities. Supporting the four sales executives (including the director of group sales) in creating/editing contracts, proposals, welcome letters, agendas, and planning client events. Collaborating daily in a cross-functional team environment with various hotel departments and community partners to ensure successful meetings. Training the new incoming sales team members and creating the onboarding training manual. Representing the organization to numerous visitors, including VIPs and vendors at hotel and hospitality industry events. Attending contribute creative ideas to weekly marketing public relations meetings to promote hotel events. Additional duties include, but not limited to, daily communication with new existing clients via phone/e-mail, conducting site tours, trade show preparation, processing commissions, creating purchase orders expense reports, and arrange coordinate film/photography shoots. Key accounts markets include finance, entertainment, food beverage, the coca-cola company, and turner broadcasting. 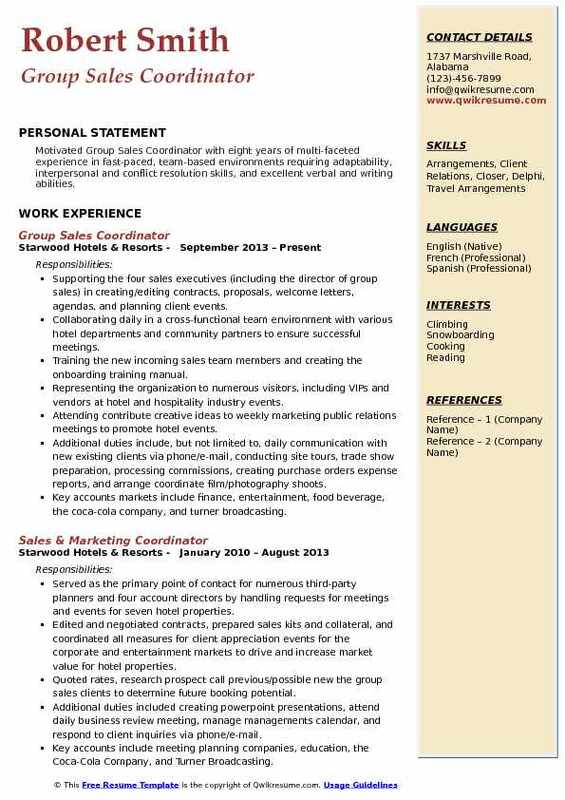 Objective : Group Sales Coordinator with 2 plus years of experience is seeking to use my significant interpersonal skills to plan and organize events while increasing guest loyalty and profits. Presenting and selling the company services and products to current and potential clients. Identifying the sales prospects and contact these and other accounts as assigned. Establishing and maintaining the current client and potential client relationships. Managing the account services through follow-up and formal customer inquiries. Preparing a variety of status reports, including activity, closings, follow-up, and adherence to goals. Communicating the new product and service opportunities, special developments, information, or feedback gathered through field activity to appropriate company staff. Liaison with food provider to ensure flawless execution of events and parties. Providing assistance and support to the director of group sales and maintaining sales collateral inventory and special amenities. Responding to the client inquiries as deemed appropriate and assist with site visits.